Sampaguita is in the family of jasmine plants and is native to southern Asia, especially India. It is the national flower of both the Philippines and Indonesia. The plant is vine-like and has a climbing nature but is fairly thick and shrubby. 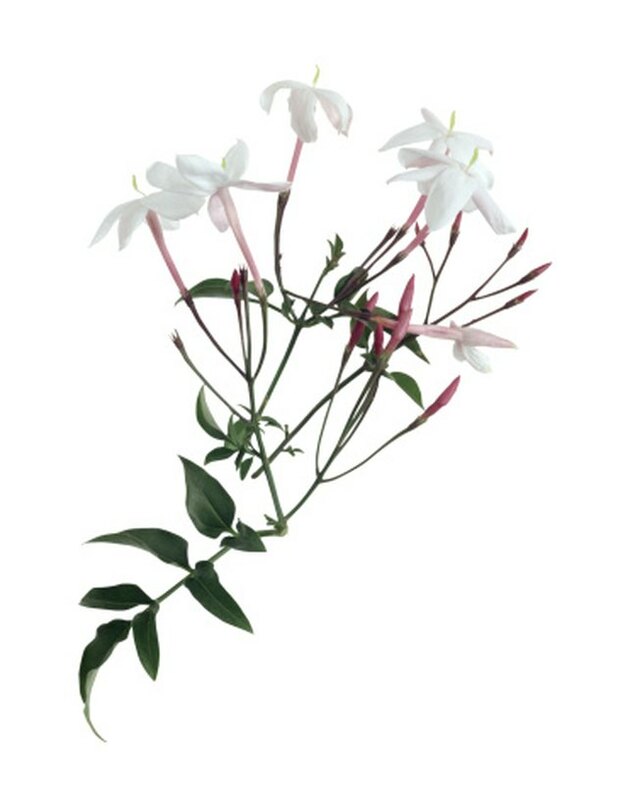 The plant is similar to the Asian jasmine but is actually an Arabian jasmine. Jasmine perfumes the air with a sweet scent and produces pure white star-shaped flowers. Sampaguita has a 1-inch wide flower that only blooms for 24 hours. Jasmine are tropical to subtropical plants that are appropriate for United States Department of Agriculture zones 9 to 11. The Arabian jasmine's white flowers fade to a soft shell pink. Plant the Sampaguita plant in well-drained soil in either sun or partial shade. Dig in 5 to 7 inches of compost to enhance the soil. Dig a hole that is twice as big as the root ball so the roots can spread easily. Remove the plant from its nursery pot and gently spread out the root ball into the hole. Backfill and press the soil in around the roots. Water after planting until puddles form. The plant will need to be kept moist while it establishes, but after that it can tolerate medium to low moisture levels. Dig a 4- to 6-inch trench alongside the plant and feel the deeper soil to assess if it is time to water. Cool soil is wet enough and needs no extra irrigation. Grow the plant in a pot in areas where temperatures drop below freezing regularly so you can move it indoors. The plant can stand temperatures down to 8 degrees Fahrenheit for brief periods of time, but ice and snow are not good for the Sampaguita. Make a mixture of half potting soil and half compost for a containerized jasmine. Provide a trellis or string up a vertical surface. This plant can be trailing or climbing, but it will need help at the start to twine up an upright surface. Twist the stems around the support as it grows. Prune the terminal ends of the plant to minimize the spread. Sampaguita can grow 5 feet in length. Cut off the ends to the next growth point to promote bushiness and the formation of more branches. Feed your jasmine with an acid lover's liquid plant food. The pH range should be 5 to 6 for the Arabian jasmine. Feed in spring and then again midway through the growing season. Follow the amount on the instructions and dilute it in your irrigation water.